Ask: How have you been helped or encouraged by someone else this week? Say: In our story we’ll hear how God encouraged Gideon to go out and fight Israel’s enemies. Say: Our main point today is: God alone saves His people. We’ll learn that God is the only one who deserves credit for Israel’s victory over the Midianites. Pray for our lesson today and that God would speak to us through the story. Say: When we succeed at something we naturally want to take the credit for it. But it’s God who blesses us with talents and gifts, so even when we do something well we can still give glory to God. Apart from God we can’t do anything. Without Him our hearts wouldn’t even keep beating! We must rely on God for everything, and that’s exactly what we will hear in our story today. We’ll learn that God alone saves His people. Say: Last week we learned that God called upon Gideon to lead the Israelite army into battle to defeat their enemies. Gideon wasn’t so sure that he was the right man for the job, but the Lord reminded him that God overcomes our weaknesses. Tell the Story: Gideon still wasn’t sure that God was going to keep His promise to defeat Israel’s enemies. So Gideon put God to the test. Gideon laid out a fleece (a sheep’s skin) and told God that he would believe Him if in the morning the fleece was wet with dew but the ground around it was dry. Ask: Do you think it was right for Gideon to test God? Say: Gideon’s faith was small but God showed him grace. In the morning, Gideon wrung out a whole bowlful of water from the fleece. But that still wasn’t good enough for Gideon! He put God to the test a second time asking that in the morning the fleece be dry while the ground around it wet with dew. Yet again, God showed Gideon grace and did as he asked. Ask: Why did God say that there were too many people in the army? (Allow kids to respond.) He wanted to teach them that God alone saves His people. God didn’t want Israel to think that the reason they had won the battle was because they were so strong. He wanted them to know that it was God Himself who gave them victory over Midian! Tell the Story: There were 10,000 men left but God said that was still too many. So he told Gideon to let the men go down to the water to drink. Gideon was to watch how the men drank, and anyone who drank from their hands was to go home but anyone who lapped up water like a dog was to stay and fight. After that only 300 men were left! God wanted to encourage Gideon so He spoke to him that night telling him to sneak into the Midianite camp to hear what the enemy soliders were saying. Gideon took his servant Purah with him and they overheard a solider telling another solider of a dream he’d had. The solider interpreted the dream saying that the God of Israel would give Israel victory over them, and He would use a man named Gideon to do it. Gideon remembered that God alone saves His people. Ask: How do you think Gideon felt when he heard this? Tell the Story: Encouraged by what he had just heard in the enemy camp, Gideon returned to his own army and instructed the men to go down and fight because God would give them victory. He gave each man a trumpet and a clay jar with a torch inside. Then they surrounded the Midianite camp. At Gideon’s signal the men blew their trumpets, broke the jars, and shouted “A sword for the Lord and for Gideon!” Then they attacked the army. God confused the Midianites so that they even started killing each other! 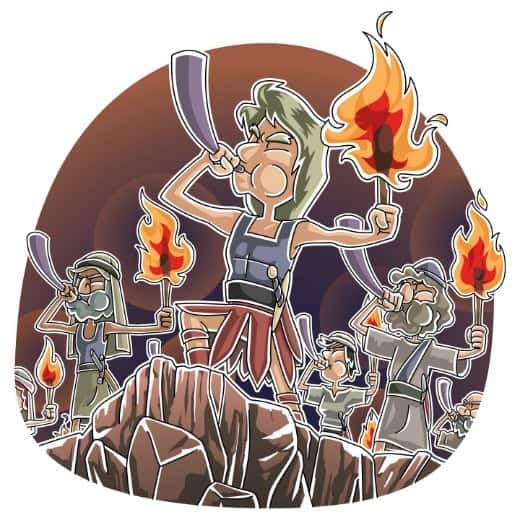 Gideon’s army had only 300 men but they defeated the Midianite army of over 120,000 soldiers! It was clear that God alone saves His people. Ask: Has God ever done something in your life that you knew you couldn’t have done on your own? Say: In some ways we are just like the people of Israel. God alone saves His people today just like in Gideon’s day. We might not go out against a huge army to fight, but God still saves us in ways that we can’t save ourselves. Say: We don’t have the power to fight sin on our own. We are too weak! But God alone saves His people by sending His Only Son Jesus to rescue us from sin. We are weak but Jesus is strong enough to save us, and God deserves all the glory! Ask: Can we take credit for our own salvation? Say: No way! God says in His Word that we shouldn’t boast or brag about our salvation because God alones saves His people. It’s by grace alone that our sins are forgiven, not because of anything we do to deserve it. Let’s pray and thank God for this incredible truth! Pray Dear God thank you for this story that reminds us that you alone save your people. Thank you for showing us your grace in forgiving our sins. We praise you because you alone are worthy of our worship. We don’t deserve your love and kindness that you show us everyday, but we pray that you would give us hearts that love you and desire to serve you. Amen. Have the kids work together to put the story in the correct order. Learning Activity 2 : What’s so Hard About That? Ask the kids to think about things that are difficult for them to do, and create a list on the board. Ask what kind of help they would need to accomplish the tasks listed. Explain that Gideon thought it was impossible for God to give them victory over their enemies. He tested God two times to prove that He would keep His promise to help His people. We can trust God to help us when we step out in faith. Thank you so much for the wonderful way you organize those lessons. They help us a lot especially whenever we do not have a ready made story. I was reading the lesson entitled God gives Gideon victory, i just want to point out to a slight mistake in the story, it is mentioned that: anyone who drank from their hands was to go home but anyone who lapped up water like a dog was to stay and fight. After that only 300 men were left! While the Bible says the opposite, those who drank from their hands were the 300 and they were to stay. The one who lapped up water like a dog were to leave.